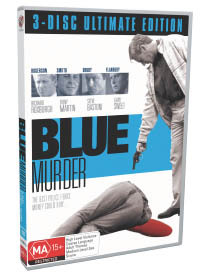 Before Underbelly, there was Blue Murder which caused almost the same turmoil and controversy as the aforementioned series. It was even delayed in certain states due one of the main characters being charged for several murders. Thankfully now, we can now watch the series in its entirety that has been released as a wonderful boxed set called Blue Murder Ultimate Edition and features real crimes and real people in this wonderful ABC series of the Australian criminal underworld. To add to the realism, the series is set in the streets of Sydney where director Michael Jenkins manages to capture the realism of the stories due to its settings that adds a link to the viewer. The series itself is set between the late 1970's to the late 1980's and follows Neddy Smith, a low life thug who with the help of the New South Whales police becomes a criminal heavy. Featuring a variety of "events" from the times, including the alleged corruption of detective Roger "The Dodger" Rogerson, Blue Murder follows the rise and fall of these men who have decided to create their own laws, fueled by money. Although the creators have taken some artistic liberties in terms of the story and certain "facts" have been added to fill in the blanks, this can be forgiven because at the end of the day, it's a gripping crime drama that once you start watching, you simply need to watch the entire series. Even though it is not as polished as the original Underbelly, I would say that its bounds and leaps better than its sequel, A Tale of Two Cities. Featuring a star studded Australian cast that includes Tony Martin as Neddy Smith, the almost perfectly cast Richard Roxburgh as Detective Roger Rogerson who are are the stars of the series, they really lend themselves to the series. Add in other key actors such as Gary Sweet, Alex Dimitriades, Gary Sweet and Peter Phelps and you have quality from start to finish in this controversial series. For a TV series of its age, the video and audio quality is quite acceptable, although it cannot be compared to the TV series of today but needless to say, it does the job quite fine. A must have Australian series for those that love well produced crime dramas!